Chhattisgarh is rich in its cultural heritage. The State has a very unique and vibrant culture. There are over 35 big and small colourful tribes spread over the region. Their rhythmic folk music, dances and dramas are a treat to watch and also provide an insight into the culture of the State. The most famous dance-drama of the State is Pandwani, which is a musical narration of the great Hindu epic Mahabharata. Raut Nacha ( folk dance of cowherds), the Panthi and Soowa are some of the other famous dance styles of the region. Pandwani – Chhattisgarh’s solo drama, which is also known by the people of other countries. Tejan Bai gave a fame to Pandwani in today’s context, not only in our country, but also in abroad. Pandwani means Pandavwani – that is Panda Katha, a story of Mahabharata. 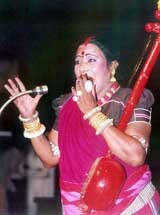 Pandwani is a folk ballad form performed predominantly in Chhattisgarh. It depicts the story of the Pandavas, the leading characters in the epic Mahabharata. It is narrated in a very lively form, almost constructing the scenes in the minds of the audience.Traditionally a male preserve, it has seen the inclusion of women artist in recent times.The artists in the Pandwani narration consist of a lead artist and some supporting singers and musicians. The lead artist narrates one episode after another from the epic in a very forceful manner. He enacts the characters in the scenes to produce a more realistic effect. Occasionally, he also breaks out into a dance movement. During the performance he sings along the rhythm produced by the ektara held in his hand. There are two styles of narration in Pandwani; Vedamati and Kapalik. In the Vedamati style the lead artist narrates in a simple manner by sitting on the floor throughout the performance. The Kaplik style is livelier, where the narrator actually enacts the scenes and characters. Panthi dance is given by Satnami community of Chhattisgarh. Songs related with dance depicts importance of human life with strong spiritual messages with prime focus on omnipotent devotion. The songs convey the spirit of renunciation of their gurus and teachings of Saints such as Kabir, Ravidas and Dadu. For Guru Ghasidas’s panths purnima of magha month is very important because they celebrate this day as birth anniversary of their guru. Their is a ‘Jaith khamb’ set up for the occasion and the dancers indulge with their panthi dance. Panthi dance is known as fast stepping dance in which performers present their dance skill and flexible movements, equipped with white dhoti, waist belt, ghungaroo. They also carry “Mridanga” and waves themselves in parade. The prime dancer starts with the initiation of song and then the other dancers repeat the dance in a step wise manner. The start of the song, music and dance is slow. But as the song progresses the dance also progresses in its pace, with increasing rhythem of Mridanga. The gestures of the step are variable with the song with group members forming human pyramid and other such complex structures in between. Mean while the rhythem of the song is maintained and magic of panthi dance continues. Main dancer of the group motivates others by chanting of Aaha, Aaha ….. loudly. Guru Ghasidas is also been reverenced. Whistle is also been blowned in between the songs, which is a sign of changing steps. The termination of song ends with the high notes. The termination of the song surprises audience with its high level of pace and changibility of steps. The group dancers are decorated simply. Simple vest, short dhotis upto knees and garlands on the neck , white tilak, turbon on their heads are main features of this dance group. Excessive clothing and decoration is also not suitable for panthi dancers. With the changing time there is a bit of change in the dresses also seen, now a days colorful shirts with jackets also been wore. ‘Mandhar’ and ‘Jhange’ are prime musical instruments but Banjo, Dholak, Tabla and Casio is also used. Panthi dance symbolises high depth of spiritual knowledge with tsunami of emotions of Bhakti. As simple the dance is on one side so is the attraction and entertainment on the other which makes it interesting. Panthi is a strong weapon unleashed with a concrete but non violent message by the people rationally discriminated by the system having ideology of dictatorship in their very nature over centuries. This dance is traditional folk dance of Satnami community of Chhattisgarh who are the followers of Satnam panth. The Panth was established by the Great Saint Guru Ghasidas. Raut dance is a traditional dance of the Yadav community which is performed on Deepawali. In this dance, the Rauts, wearing a special costume, sing and dance in group with stick in their hands in the pathways of the village. After the performance of dance in the house of every householder, they gives blessings to every household by singing songs of blessings. ‘Timki’, ‘Mohri’, ‘Dafda’, ‘Dholak’, ‘Singabaja’ etc. are the main instruments of this dance. ‘Dhohas’ are sung in between the dance. These ‘Dhohas’ are filled with devotion, policy, humor and mythological references. Men are mainly involved in Raut dance but children also eagerly follow them. Generally, tribal life style is described in ‘Dhohas’, which is accompanied by dance. Reflections of tribal philosophy and their ideal music and songs, they mesmerize the viewer into another world. It has a variety of music. 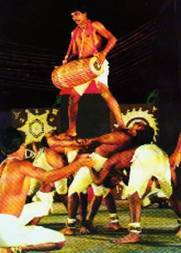 The prime musical instruments in cultural performances are ‘Mandaar’, ‘Dhol’ and Drum. Raut Nacha is a popular form of entertainment and accomplished drama for seven days of the festival of Deepawali. It portrays the diverse stories of war during Mahabharata times as dance and music in an unusual way. In addition, verses of poet Kabir and Tulsi fill the memory of ancient times in the mind of the prehistoric tribal communities of Chhattisgarh. Raut dance is similar to Gopi’s dance with Lord Krishna. Songs are sung by some members of the group, some play musical instruments and some members dance with wearing bright and colorful clothes. Dance is usually done in groups. The dancer carry a colored stick and metal shield in their hands and and they wear Ghoongharoo in their vests and ankles. They respect the brave warriors in this dance and tell about the ancient battles and the eternal victory of good over evil. Dance represents the mythical battle between King ‘Kans’ and Lord Krishna and celebrates victory. And in the evening, ‘Matar Madhai’ are organized in many villages.